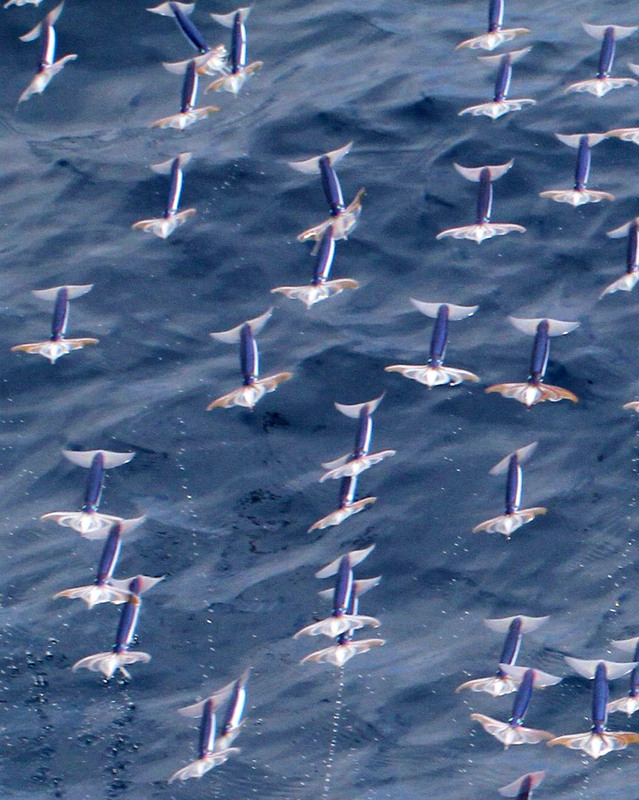 Image taken by Kouta Muramatsu of Hokkaido University on July 25, 2011 shows the oceanic squid flying in the air in the northwest Pacific Ocean. It propels itself out of the ocean by shooting a jet of water at high pressure, before opening its fins to glide at up to 11.2m per second, the university said. A species of oceanic squid can fly more than 30 metres (100 feet) through the air at speeds faster than Usain Bolt if it wants to escape predators, Japanese researchers said Friday. The Neon Flying Squid propels itself out of the ocean by shooting a jet of water at high pressure, before opening its fins to glide at up to 11.2 metres per second, Jun Yamamoto of Hokkaido University said. Olympic Gold medallist Bolt averaged 10.31 metres a second when he won at the London Games last year. "There were always witnesses and rumours that said squid were seen flying, but no one had clarified how they actually do it. We have proved that it really is true," Yamamoto told AFP. Researchers say is the first time anyone has ever described the mechanism the flying mollusc employs. Yamamoto and his team were tracking a shoal of around 100 squid, part of the Japanese Flying Squid family, in the northwest Pacific, 600 kilometres (370 miles) east of Tokyo, in July 2011. Graphic on a species of squid that can fly more than 30 metres through the air to escape predators. The squid are in the air for about three seconds and travel upwards of 30 metres, said Yamamoto, in what he believed was a defence strategy to escape being eaten. But, he added, being out of the ocean opened a new front, leaving the cephalopods vulnerable to other predators. "This finding means that we should no longer consider squid as things that live only in the water. It is highly possible that they are also a source of food for sea birds." The study was published by German science magazine Marine Biology this week. News of the finding comes after other Japanese scientists last month unveiled the world's first pictures of the elusive giant squid in its natural habitat, deep in the Pacific ocean. Japan's National Science Museum succeeded in filming the huge creature at a depth of more than half a kilometre (a third of a mile) after teaming up with Japanese public broadcaster NHK and the US Discovery Channel. Footage of the giant squid -- Architeuthis to scientists -- provided final proof of the quasi-mythical ocean-dwelling beast reported by sailors for centuries.